Giving families back pieces of what was taken from them by Autism. Adults living with autism will vary in their abilities to care for themselves, much like children. You will find that some adults who are autistic will live semi-independent lives, while others will be 100% dependent on caregivers. Therefore, caring for an adult with this disorder can become difficult. Resources to help these adults are different, depending on your community and state; although you will find most areas have at least some vocational training programs to offer. Programs such as this are designed to allow eligible autistic adults with the chance to work toward improving their daily lives to become as independent as possible. In other areas, you will find opportunities that offer supported employment; with these programs the adults get both training and employment. If you are planning to secure the future of your family member affected by Autism, then we should talk. Our goal to create a safe-haven for adults with Autism called Whats2Bucks Foundation. Essentially our supported living will provide a safe place where your adult with this disorder can live out their lives. Our supported living will have the same level of care you provide as a parent; however, this will allow you time to yourself, because after all you've earned it! It is tough taking care of children of all ages when they are living with autism. We know first hand and have gathered over 25 years of intel to share with you. We are parents of a 26-year old son with low functioning Autism. They have devoted much time, energy and money into his care over the years. We know you have the same heartache and pain, over the prom that will never be, grandchildren we will never meet, the base ball games he cant play in. We are lucky this journey has not tore us apart after all we've been through. It strengthened our mission to create a program that will guarantee community engagement, housing, employment, respite and more for adults living with autism. The premise behind the name "what's 2 bucks" refers to the fact that something as little as a $2 donation can make a huge difference in the lives of parents and children in this situation. If 1 million people donated only $2 bucks we could make the difference in many lives. If you are a GRANT WRITTER or Corporation looking for a charity t support- please consider us. 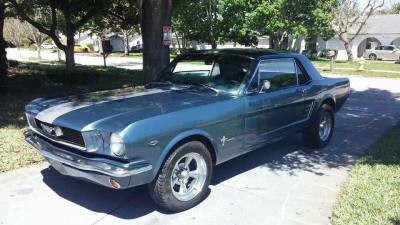 We have this 66 Mustang to Raffle and or jsut sell outright to get us started.